Description: North Percy Peak is located in Northern New Hampshire on State lands on the Nash Stream purchase. This prominent peak looks more like a Tuolumne Dome near Yosemite Valley in California than a typical Eastern Mountain. 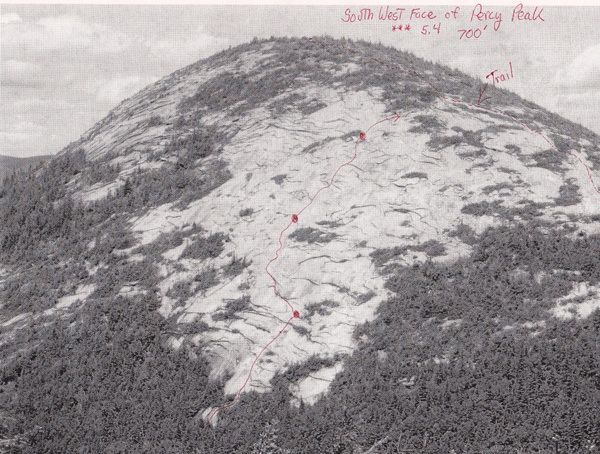 North Percy Peak has a very obvious slab on its South West face that can be clearly seen from many miles away. The cliff is at a uniform angle and difficultly the entire way with many locations for climbing protection in both vertical flakes and overlaps. The climbing varies between sections of 5.4 and 5.3 climbing that are always interesting and on attractive rock. The rock is very course, naturally clean granite that offers excellent friction. This is a perfect climb to do in your sticky rubber approach shoes. It is possible to climb anywhere on the face but the route described below links the best rock and the longest pitches on the slab. Directions: Driving directions are from west. � After 2.6 miles on Route 110, take a left onto Emerson Road. � Follow this road for 2.2 miles until the road makes a sharp right-hand turn. � At this point, turn left onto Nash Stream Road and follow it for 2.7 miles to a small, signed parking area on the right. � The Percy Peaks Trailhead is 50 yards farther up, on the right, and is signed. From Berlin take Rt. 110 NW to Stark. Turn right and take the North Side Road thru the covered bridge, turn left after the bridge and drive 4-5 miles north west to the Nash Stream Road on the right. Turn right onto Nash Stream road and follow it for 2.7 miles to a small, signed parking area on the right. The Percy Peaks Trailhead is 50 yards farther up, on the right, and is signed. From the Nash Stream road trailhead follow the Percy Peaks hiking trail for approximately 1.5 miles (steeply at the end) till just before the saddle between North and South Percy Peaks. Just before the trail starts to level out at the saddle it climbs up on the spine of a small rock wall. Just before you step down off the walls top the climb can be seen looking North above the trail on the left. Walk 50�or so further to a right bend in the trail and head left and uphill into the woods.